– I WONT be using NAT’ing in this Lab. 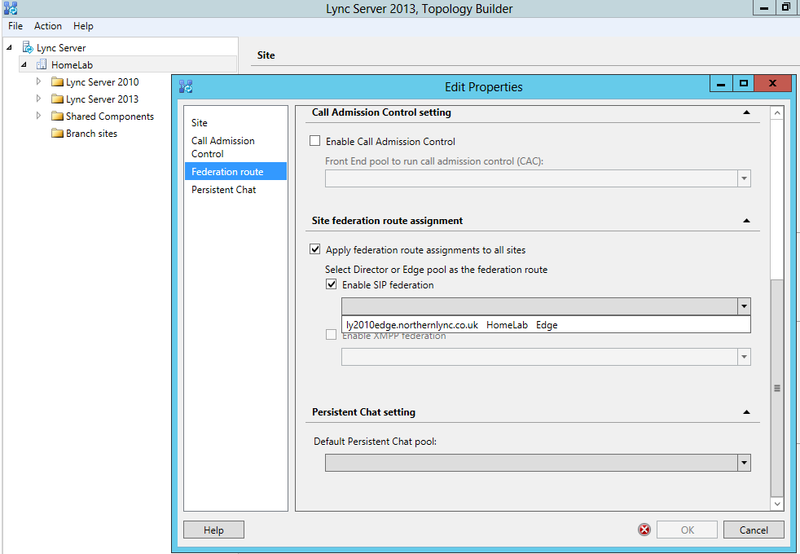 – Copy of the Lync 2013 installation files locally to the edge server. So to note: As part of the installation, the edge server is within my DMZ and not attached to the northernlync.local internal domain. We need to do a few things to prep the server ready for the edge install. Adding the DNS suffix to the edge server even though its part of a workgroup. Once you’ve rebooted your server, and also copied over the Lync 2013 media locally you are set to start the installation. Once you’ve right click, next through the first welcome page until you get to add the information about your edge server. On the next page you have a few options. On the next dialog page, you have the option for NAT’ing and also for using IPV6. For this lab we won’t be using NAT’ing or IPV6. Therefore i will be accepting the defaults. If you are NAT’ing at the next screen you will be asked to add the internal NAT’d IP address. Then select the pool to associate with the edge server for connectivity. this is usually the same pool as your next hop pool from the previous page. Now we are almost finished on the Lync Frontend.. the last item we need to do i copy over the cms configuration to the edge server for population. We are now finished on the Frontend topology. Double click or select the global option, then select the options you want. Also based on the information your require i.e. : open federation etc, you will need to configure the other tabs within the control panel. for this demo we are going to go open federation. Then select and complete step 1, and select the .zip file for the csconfiguration when prompted. you will then get a txt file like the below. Now do the same with the public cert, then pass this to your public CA ie: go daddy, comoro etc. Now start the services and test.! Thank you for looking. and i hope the above makes sense and provides you with a functional edge topology.